I am sorry for the recent lack of activity. I have been fighting a cold and trying to get healthy for a trip to New Orleans. I have been cooking but just haven't had the energy to post anything. Hopefully my sense of taste returns because I am looking forward to stuffing myself in NOLA. I am not sure if I had southern food on my mind but when Jess decided she wanted buttermilk waffles for breakfast I figured I might as well make some buttermilk fried chicken to go on top. This chicken is pretty fool proof; the only real danger is cooking it too long and having to make up for it by dousing it in syrup. I love the mix of sweet and savory. We added some fresh strawberries and a fruit shake to this meal because it had that distinctive non-color of food that will kill you. In the interest of keeping our apartment from smelling like fried chicken here is the ghetto fryer station I setup on the patio. In a covered bowl or dish soak the chicken in the buttermilk (preferably 45min to 24hrs prior to cooking). In a large plastic bag mix the flour and all the spices. Add the chicken to the bag and shake it like a Polaroid picture. Fry the chicken at 375 degrees F for 4-7 min (depending on how thick it is). I will get some waffle recipes up soon. Jess's parents have a vintage waffle iron that churns out the tastiest waffles. It is surprising how good the chicken is, I always thought that fried chicken was something only Colonel Sanders could pull off, but it looks like I can too. When Jess and I were living in Australia there was an awesome Thai restaurant down the street from us that was affordable and delicious. I think there are some great Thai places in Calgary but also feel that they are super expensive. This recipe was close to 30 bucks for ingredients but I could have probably made enough for 8 people so my attempt at affordable Pad Thai fell short. The nice thing was that I got to decide how much of the different ingredients I was going to get. This was loaded with chicken and shrimp. I couldn't find Tamarind paste to make my own sauce so I had to use a packaged sauce. I added additional spice to create more flavour. 1 package HaiKu "Authentic Pad Thai Sauce"
I started by filling a large pot with water and setting it to boil. Chop the garlic and chili or throw in a small food processor and chop (you can also do this with the peanuts). Heat one tsp of oil and fry the eggs and set them aside. In the same pan add the chicken and cook on high until it is nicely browned. Add some stock and the garlic/chili. Add the shrimp and Pad Thai sauce. Lower the temp and let it cook down for 4 or so mins. In the boiling water cook the noodles for 3-4 min (they should be a little chewy). Drain the noodles and run cold water over them to stop the cooking process. Add the green onion and noodles turning the temp back to high. Mix the noodles and fry until they are reheated. Add the bean sprouts and cook for another minute. Plate and garnish with cilantro, lime and peanuts. You can add the "optional" sauces to get the taste you are looking for. We went snowshoeing with our friends last weekend and volunteered to make the first meal. 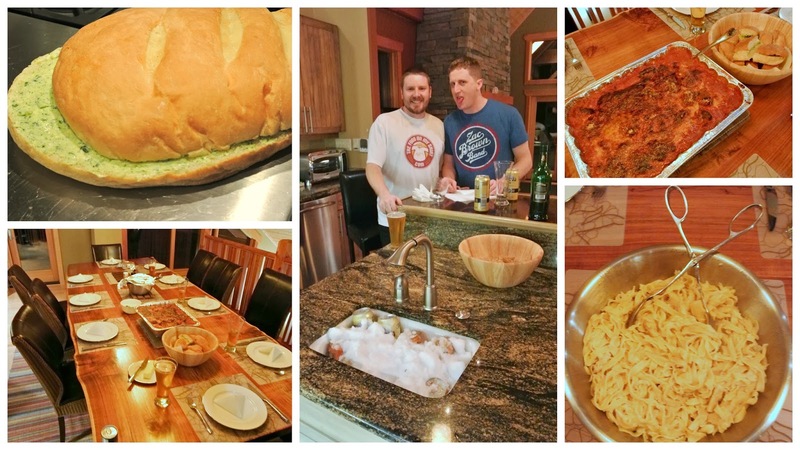 We wanted something easy that would make useful leftovers so we decided to make pasta, meatballs, some garlic bread, and a marinara sauce. When we went to New York I was introduced to Carmine's restaurant and ended up getting "Carmine's Family - Style Cookbook" for Christmas. One of their trademark items is their meatballs. I used their recipe as a guide for my own recipe and they turned out to be delicious. They were juicy, flavorful, and light despite being a cheese infused hunk of meat. My balls ended up being versatile; I used them with the pasta, in meatballs subs and meatball stuffed ravioli. They would be great on a meatball marinara pizza as well. My recipe mixes up the ingredients from Carmine's recipe but maintains the techniques that infuse the flavor in the meat. If you have the time I suggest mixing the meat 24hrs in advance so the flavors have time to come together. In a medium bowl tear up the bread and soak it in the butter milk. In a large bowl mix the beef, pork, eggs, salt, bread crumbs, and cheese. In a stand mixer finely chop the herbs and garlic. Add the herbs and soaked bread and mix until evenly blended. Roll into balls and pan fry until golden on the outside (you don't need to cook them through if you plan on simmering them for a while in a marinara sauce). Jess and I just got back from a snowshoeing trip with our friends and didn't have much around the house for breakfast. She wanted pancakes so I scrounged through the fridge and found just enough ingredients to make these amazingly fluffy Chocolate Buttermilk Pancakes. I barely had enough of the wet ingredients but ended up with enough pancakes to feed an army. We were stuffed after one. This recipe made 6-8 10 inch pancakes. Heat a pan and lightly butter it. When you are ready to go mix the wet and dry ingredients. I used about 1 cup of batter per pancake. Add the batter and let it cook until you see bubbles coming to the surface (if you flip it too soon you will have a giant rooster tail of batter fly across your kitchen). You could mix up the proportions of buttermilk and almond milk to get the chocolate flavour you are looking for. These had a subtle chocolate flavour and were a perfect syrup and butter sponge.